Tom is 4 months old! It's shocking how fast time passes. Tom is already 4 months old. In 4 months time I'll be back at work. It'll still feel too soon. Still, in the meantime I am enjoying every day I spend with my boys! I love my boys! One of the best things in all the world (and forgive me if I have said it before, but it's true) is simply sitting on the sofa with Tom on my knee, and Jack snuggled up next to me with my arm round him, while we settle in to watch a DVD. It means I get to cuddle both my boys at the same time for a while. Jack is still the doting big brother. Everything is "Tom!" all the time. 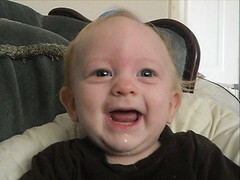 "Tom's Toy" or "Tom's Tea", he laughs himself silly if Tom smiles at him, and then Tom laughs back too. It's SO sweet! 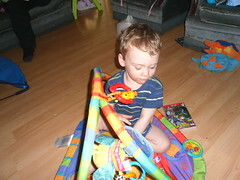 He loves to play with the baby toys too - and at the same time Tom is eyeing up everything of Jacks! Tom's getting to be so big too. He's now in 6-9 month baby clothes and has been for a couple of weeks. He's having some baby rice and some rusk with his milk. He's due for his jabs this week and I'll get him weighed. He's spinning round on the spot now when he's put on his tummy to play and is starting to look like he might roll over if he's on his back - especially on his change mat because he can dig his toes into the side from leverage! I wonder if he'll be crawling - or more - by Christmas!